SIZE SMALL AVAILABLE FOR : Woman's Size 3.5-7. SIZE MEDIUM AVAILABLE FOR : Woman's Size 8--9.5, Man's Size 6.5--8. SIZE LARGE AVAILABLE FOR : Woman's Size 10--13.5 Man's Size 8.5--12. If there is any breakage, please contact the replacement in time. GET THE PERFECT FIT: Prevent painful blisters and stop wearing shoes that hurt! Stretch both the length and width of your shoes to get a roomier, custom fit every time. Best used for breaking in your new shoes or loosening up older shoes that are just too tight. SIZE LARGE AVAILABLE FOR : Woman's Size 10--13.5 Man's Size 8.5--12. Fits both left and right shoe. Can be used on flats, pumps, wedges, loafers, oxfords, pointed toe, sneakers, and tennis shoes. Works well with leather, suede and other natural materials. The shoe stretcher don't fit boots and high heels (>6cm). 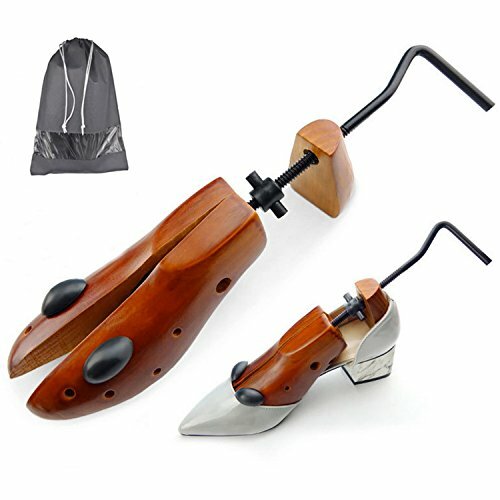 PACKAGING: 2 pcs shoe trees ,1 big shoe carrying bag and 8 Bunion/Corn Plugs. If you have any question please contact with us. Please choose the correct size shoe stretcher according the size of your shoes and read our description carefully. If you have any questions about this product by Agirlvct, contact us by completing and submitting the form below. If you are looking for a specif part number, please include it with your message.